Meade 505 Connector Cable Set #07505. This is a computer to AutoStar or AudioStar connector cable only. 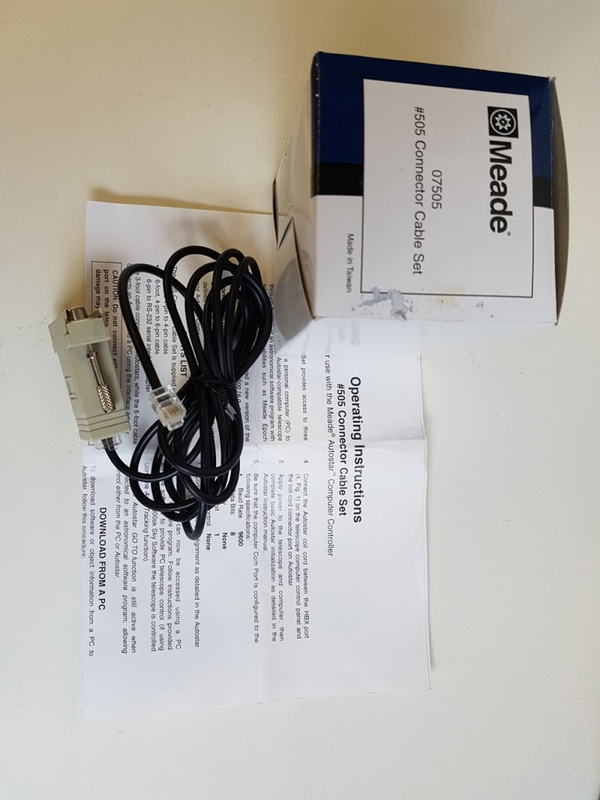 Allows connection of a Meade #495 or #497 AutoStar keypad, or Meade #497 AudioStar keypad to a computer serial port using Meade AutoStar Suite software, available for free download at Meade's website. This cable and software are compatible with computers running Microsoft Windows. When used with appropriate software it allows for telescope control from the computer, downloading software updates, and cloning one keypad to another so you can share user created databases. Software not included. Comes with a 3 foot 4 pin to 4 pin cable, a 6 foot 4 pin to 6 pin cable, and a 6 pin to RS-232 serial interface adapter. For use with #495 or #497 AutoStar, and #497 AudioStar keypads as supplied as standard equipment on Meade ETX-90, ETX-125, LXD75, LX80, LX90, LT, LS (LightSwitch) and other models. Note: A USB to serial converter cable may be needed for computers that do not include a serial port. This cable can be used as part of an auto-guiding setup. Your computer must have the ASCOM software platform installed (http://ascom-standards.org/). Then install your preferred auto-guide application software e.g. PHD Guiding, AstroArt, MaxIm DL, etc. Form the application's option menus, select ASCOM as the chosen auto-guide method. Finally, from the ASCOM options select the appropriate telescope model.